The lane at the side of West Lodge Hotel was once the tree-lined drive leading to Aston Clinton House, country residence for Sir Anthony de Rothschild and his family from 1853 to 1923. West Lodge was one of two ‘Lodge’ houses. John Taylor, landscape gardener and land steward to Sir Anthony and Lady de Rothschild for over 25 years, resided at West Lodge with his wife Elizabeth. John Taylor died in 1896 and is buried in St Michael & All Angels Church at the rear of the hotel. By the end of 1896 ‘West Lodge’ was occupied by the new Head Gardner, William H Warren, his wife Mary and young baby Ethel. By this time the area to the rear of the hotel had been cleared to make way for the kitchen garden with its extensive range of glasshouses and living quarters for staff. By 1923 the kitchen garden is described as being in a high state of cultivation and including a fig house, vinery, peach and cherry houses. During the second half of the nineteenth century the Rothschilds acquired and constructed seven grand houses in the Vale of Aylesbury. The Manor House at Aston Clinton is no longer standing; the National Trust owns Waddesdon Manor and Ascott House. Halton House is the Officers’ Mess at RAF Halton. Tring Arts Educational School occupies Tring Manor House while Mentmore Towers and Eyethrope Pavillion are still privately owned. Anthony Rothschild bought the Aston Clinton estate from Lord Lake in 1851. The house was not ostentatious, even after a number of building projects, and was described by Lord Roseberry as ‘the only Rothschild mansion that could be called a gentleman’s house’. Louisa, Anthony’s wife, was initially disappointed with the Manor House. 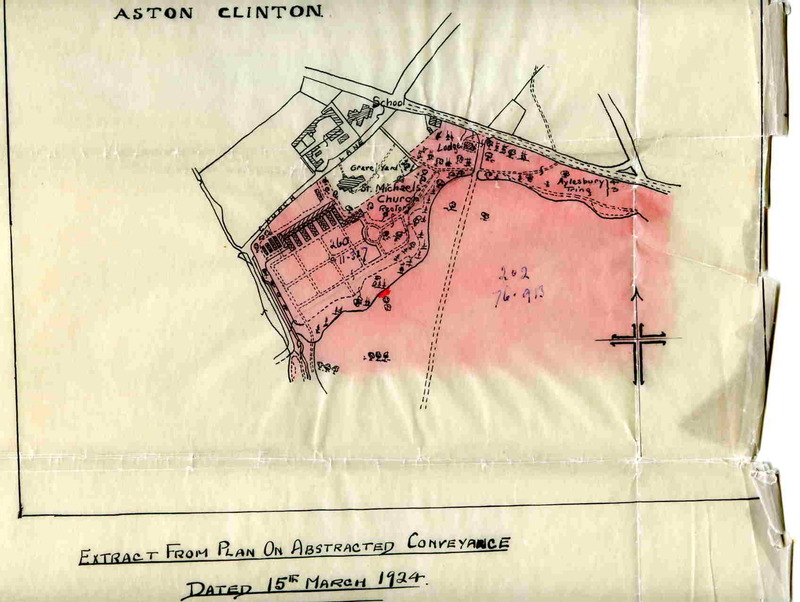 “Aston Clinton is not the house I dreamt of”, she wrote in her diaries. Nevertheless, she and her daughters, Constance and Annie, who spent much of their childhood there, came to love the house. It was the setting for many entertainments, both formal and intimate. Here Sir Anthony hosted shooting parties at which thePrince of Wales was a frequent guest, while distinguished artists, such as Hallé and Joachim, were invited to perform at the family’s musical parties. The Rothschild family founded two schools in the village, helped with a third, and gave the ‘Anthony Hall’ to the village in memory of Anthony Rothschild. Following the death of Lady de Rothschild the villagers collected 100 guineas and built a drinking fountain in memory of ‘the beloved Lady of Aston Clinton’. The fountain was unveiled in May 1911 and still stands on the London Road (turn left onto the main road, the fountain is 200metres on the other side). Unfortunately the top of the fountain was stolen leaving it looking far from its best! Aston Clinton Manor House and the 1000-acre estate under went major expansion and renovation work during this period. George Devey was appointed architect in 1864 and designed a large number of workers cottages, the park gates and it is believed the Lodge house. Aston Clinton Manor House and estate were sold in 1923 and the Warren family vacated West Lodge. Dr Albert Edward Bredin-Crawford established a preparatory school at the mansion house in the same year. The most famous person associated with the school was the writerEvelyn Waugh (Decline and Fall, Brideshead Revisited amongst others) who was appointed assistant master in 1925. Evelyn Waugh was fired in 1927 after making a pass at the school matron following an evening at the local pub. In 1931 Crawford closed the school and re-opened the mansion house as a luxurious sports hotel, country club and restaurant. The Hon. Mrs Victor Bruce performed the opening ceremony -the first person to fly from England to Japan, the first to fly the Yellow Sea, and the first woman to fly around the world alone (crossing the oceans by ship). The Sports Hotel failed and Crawford moved away. After his death in 1952 his ashes were buried in his wife’s grave in the churchyard of St Michael & All Angels (at the back of West Lodge). The estate was sold to Charles Richard Stirling in 1932 and the mansion house converted into Howard Park Hotel. At the end of 1933 Stirling started to sell off parts of the estate. ‘West Lodge’ was sold to Mrs Lilly Maud Bland Wilson who continued to own the property until 1946. During the Second World War the Manor House was used as a hospital for war wounded and the stables for radar research. After the war, the main house became the victim of fire and was finally demolished in the early l960’s. The Wendover Arm of the Grand Union Canal passed through the grounds of Aston Clinton Manor and was used for the transport of cattle and coal to the Rothschild estate. Today the canal runs along the south-east boundary of Aston Clinton Park. The park is at the end of the lane at the side of the hotel. A lovely walk with views over the Vale of Aylesbury. Green Park Conference Centre now occupies the site of the old mansion. West Lodge continued as a family home until the mid 1980’s when it was opened as a small hotel. The current owners have been running the hotel since 2003 during which time the Lodge has undergone major renovation work. The plaque at the side of the hotel commemorates Thomas Fairfax who was made Commander in Chief of the Parliamentary Army in 1645. For much of the Civil War the front line between the King and Parliament ran along the Buckinghamshire and Oxfordshire boundary. Parliamentary Garrisons were based in Aylesbury and Newport Pagnell. A mural at the end of the dining room commemorates the first Hot Air Balloon flight by the Montgolfier brothers from Paris in 1783. The hotel has always had strong links with Hot Air Ballooning. Situated at the crossing of two Roman Roads (Icknield Way and Akeman Street). The village was originally called Estone/Eston meaning East Farm. At the time of the Doomsday Book (1086) the village was held by Edward de Salisbury and consisted of 28 villagers, 4 smallholders, 13 slaves and 300 pigs. The Clinton came from Willelmus de Clinton who held Eston in 1208. In 2001, archaeologists unearthed the remains of 19 Saxon settlers, including children, at the site of the Aston Clinton bypass. The burial site includes artefacts such as daggers and necklaces. The remains were dated to 5th – 7th century AD. The digs also unearthed signs of Bronze Age, Iron Age, Roman and Medieval civilisations, including tiles from a Roman under-floor heating system and a Medieval windmill. Just to the rear of West Lodge is the oldest building in the village – St Michael & All Angels Church. The Nave and Chancel were built in the 12th Century, the South Aisle and probably the Tower, were added in the late 13th Century. The North Aisle, with the heads carved on the columns, completed the building in the 14th. Lady de Rothschild gave the village hall, Anthony Hall, to the village in memory of her husband who died in 1876. Inside hangs a painting of his two daughters – Connie and Annie. This is one of the villages listed buildings. The Boy’s School, now part of Aston Clinton Combined school, is also listed. The school was rebuilt in 1887 and the Jubilee Clock erected to commemorate the Diamond Jubilee of Queen Victoria. Before hill climbing was disallowed on public roads (in 1923) Aston Hill hosted an event for 20 years. During this period Lional Martin had much racing success and named his motor company‘Aston Martin’. Aston Hill is now one of the premier mountain biking tracks in the southeast.